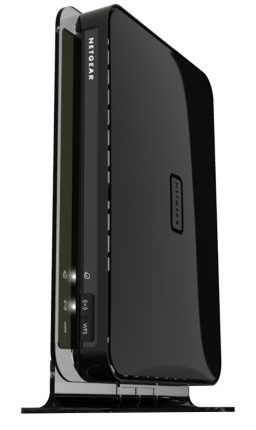 The NETGEAR Wireless Router for Video and Gaming (WNDR37AV) offers the outstanding speed and performance demanded by gamers as well as users who enjoy streaming video. It features a powerful processor, dual-band Wireless-N, USB storage access, ultra-fast gigabit Ethernet ports with auto-sensing technology, a dedicated video network, guest networks, enterprise-class wireless security, and much more. Whether you are streaming HD video or playing the latest online games, you'll enjoy a hiccup-free and lag-free experience. Dedicated Video Network and Video Mode. Powerful 680 MHz Processor for Outstanding Performance. Dual-Band Wireless and Gigabit Ethernet for Fast Speed. Smart Wizard and Push 'N' Connect for Easy Setup. Enterprise-Class Wireless Security and Guest Network. Live Parental Controls and Guest Network Access. ReadyShare for Fast Backup and Storage. We have gone wireless, and disconnected the cable! That's right. I said it...we DISCONNECTED THE CABLE! How did we do it? It was easy, many of our programs are available online through our various subscriptions. We have Netflix, HuluPLUS, and Amazon On Demand which streams movie's and our favorite shows directly to our television's through our Roku, Wii and Playstation 3. We also have digital antenna receiver's for each of our TVs (providing us with network television channels with the same quality digital picture that we had with cable). We have all the entertainment that we can ask for, and we have eliminated the $100 monthly cable bill (I'm so thrilled with the savings, I could dance a jig!). Because we have so many devices that are operating off of our wireless network now, it was necessary to find a new router that could handle the demand (buffering while watching a movie or show is never fun). As NETGEAR is a name that we have come to know and trust in our home, I was excited to try out the NETGEAR Wireless Router for Video and Gaming (WNDR37AV)! After a quick and simple setup (no need to be tech savvy, everything is very clear) we had all of our devices online within a short period of time! To put the router to the test, I tried to watch a movie on Netflix while my husband was streaming another movie on a TV upstairs, while B had his Nintendo DS connected to the home network, and the princess was playing a game on PBS Kid's online! With four devices connected to the Internet, I had absolutely no issues with buffering! The kid's were able to do their thing, and we could watch our movies. The NETGEAR Wireless Router for Video and Gaming has made our Home Entertainment experience so much Better! Whether your looking to cut the cable and go wireless like us, or you simply want to speed up your connection for an excellent gaming experience, the NETGEAR Wireless Router for Video and Gaming (WNDR37AV) is essential for the VERY BEST Home Entertainment & Gaming experience!